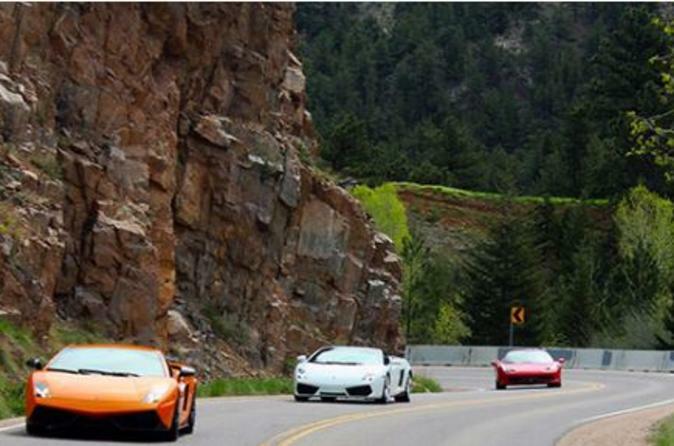 Take a luxury racing car along 500+ turns on this 65-mile, 3 canyon drive outside of Golden, CO. Accelerate along thousands of feet of straightaway and around hair-pin curves in order to test the limits of a premium super-car on this instructor led group ride. Switch cars half way through to experience 2 different supercars. Film your experience using professional grade VBOX recording equipment or include a friend or loved one with the +1 passenger upgrade. Why settle for a test ride when you can explore some of the best driving roads in North America? This 65-mile super car tour challenges you to find out what some of the fastest cars in the world have to offer. Starting in the the quaint mountain town of Golden 25 minutes outside of Denver, this tour starts with a short introductory session where you will learn everything you need to know to stay safe and comfortable during your ride. After getting behind the wheel of your select super car such as a limited release Lamborghini or specialized Porsche, you will make your way towards the towering mountains ahead. Climb into the hills and proceed to the canyons- that's where the fun starts. The route will include more than 500+ turns through pine and cedar forest, past roaring streams and rivers and across open straightaways allowing you to flex the full capabilities of the roaring engine at your control. Want a friend or loved to join? Select the +1 upgrade and switch drivers or bring a passenger along to ride shotgun. The longer, 65-mile test drive includes the option to drive two different cars you can switch between half-way through. Each tour is led by a professional driving instructor who will communicate via walkie-talkie throughout the experience. This 65-mile canyon ride is for the discerning enthusiast and adrenaline junkie who wants to experience the full range and abilities of a fully capable luxury racing car on the exciting and challenging roadways of the Colorado mountains and river canyons.